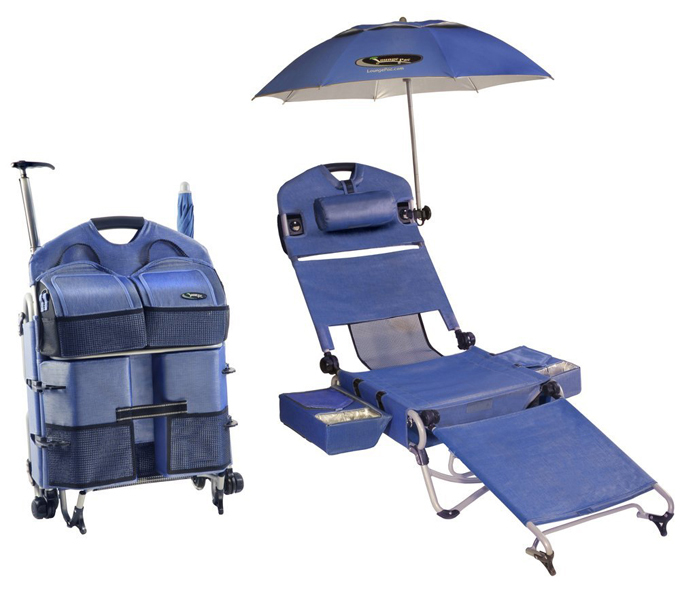 LoungePac Chair Is For Professional Beach Bums Only | OhGizmo! Summer is on everyone’s mind these days, and that means trips to the beach are on the horizon. You can either go there like an amateur, with… a towel. Or you can gear up and bring the LoungePac Chair. When folded up, the 10kg (22lbs) chair is not much larger than a carry on bag, measuring 32″Lx25″Wx12″H. Once unfurled, ten seconds after you reach, you have got an adjustable umbrella, two large thermal Coolers with cupholders (coolers can hold wine bottles), and a removable tote bag. Even the leg support is removable if you fancy having your toes in the sand. Versatility at the beach doesn’t come cheap, though: $259. Where do I hook up my laptop?